We know you've been waiting impatiently for this news so we'll cut straight to the point: the 4.7-inch screen-toting, 4G-rocking, multi-shelled Nokia Lumia 625 has been given a UK release date. And here they are: the Lumia 625 will be available from O2, Vodafone, EE, Carphone Warehouse and Phones4U from August 28. If you're up for a contract, you'll get the handset for free on a £21/month deal, while the SIM-free PAYG option sees the Lumia 625 priced at £179. It's true what they say about the early bird - it gets a free orange, yellow or green shell if it buys a black or white Lumia 625 for a limited time at launch. That is what they say about the early bird, right? 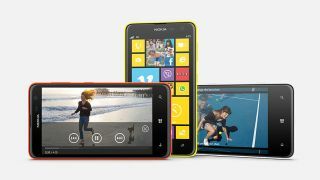 The headline act is, of course, that 4G connectivity - with EE already running its network and O2 and Vodafone set to launch their 4G networks on August 29, the Lumia 625 is arriving just in time. We've had a go on the handset - have a read of our hands on Nokia Lumia 625 review, then see what the rest of the team made of the thing at launch in our TechRadar Reacts.